Introduction and objectives As part of the care of Ataxia Telangiectasia Patients, a baseline swallow profile is obtained using a videofluoroscopy. It was observed that penetration or aspiration of oral intake did not appear to have a direct link to chest infections in these patients. The authors conducted a pilot study, analysing retrospective data to explore this observation further. Methods All variant AT patients who attended a multi-disciplinary (MDT) annual review appointment between 01/2013–11/2015 and underwent a videofluoroscopy were included. The patient was ranked on the Penetration Aspiration Score (PAS) from the videofluoroscopy. Retrospective data of the frequency of chest infections requiring treatment with antibiotics in the last 12 months was collected from the annual assessment reports in the medical notes. Initially, 37 patients were included, this was reduced to 30 as 7 videofluoroscopies were not sufficient for calculating the swallow trigger delay. 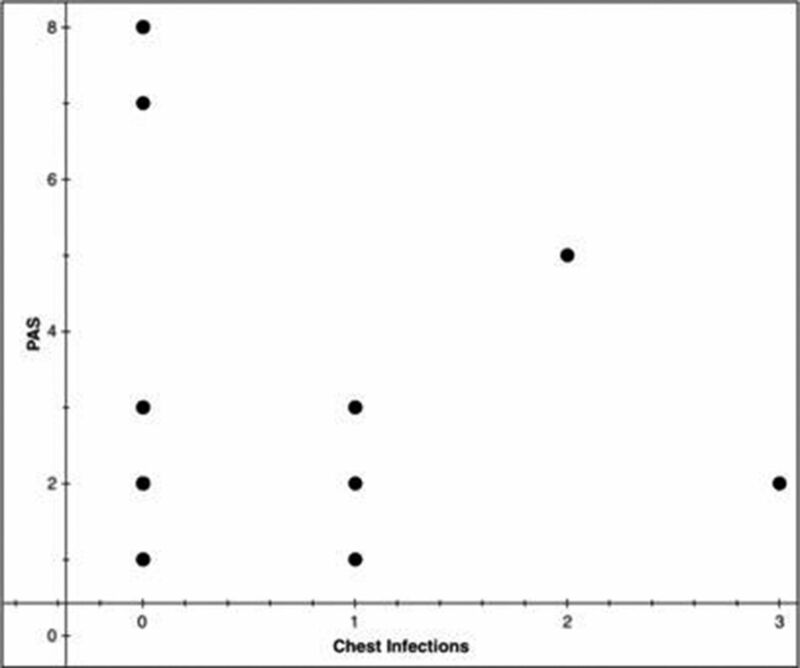 Data was analysed using excel and xlstat (standard descriptive tests and Spearman’s) to evaluate any correlation between aspiration or penetration and number of chest infections. Results With a confidence interval of 95%, there was a negative correlation of rs 0.079 (p-value < 0.0001) indicating a very weak correlation. The number of chest infections data was significantly skewed at a result of 2.643. This may be due to the small sample size. Conclusions This data suggests there is no correlation between aspiration or penetration and the chest infections experienced by AT Patients. However, this was a small sample due to the rarity of the genetic disorder. A larger sample either through increased length of time that the data is collected or an international study could help provide greater insights into the correlation between aspiration or penetration of oral intake and the number of chest infections experienced. Rosenbek JC, Robbins JA, Roeker EB et al. A penetration-aspiration scale. Dysphagia 1996;11(2):93–98.